Guide to working with the Security Token Service. ForgeRock® Access Management provides authentication, authorization, entitlement and federation software. This guide covers concepts, configuration, and usage procedures for working with the Security Token Service provided by ForgeRock Access Management. This guide is written for anyone using the Security Token Service in Access Management to manage token exchange. AM's Security Token Service (STS) allows AM to bridge identities across web and enterprise identity access management systems through its token transformation process. Web services and requestors (that is, consumers or clients) are typically deployed across different security domains and topologies. Each domain may require a specific security token type to assert authenticated identities. STS provides a means to exchange tokens across these different domains without re-authenticating or re-establishing trust relationships while allowing the requestor access to a web service's protected resources. A Security Token Service (STS) validates, issues, and cancels security tokens. REST STS. AM provides a REST-based security token services. Note that the REST STS does not conform to the WS-Trust specification but provides a simpler deployment alternative than SOAP STS for token transformations. SOAP STS. AM supports a fully WS-Trust 1.4-compliant Security Token Service. The requestor is a web client or programmatic agent that wants to use a service offered by the web service. The web service allows authenticated and authorized clients to access resources or applications. The identity provider stores claims about subjects and works with the STS to issue security tokens. The STS acts as a trusted third-party web service that asserts the identity of a requestor across different security domains through the exchange of security tokens and brokers a trust relationship between the requestor and the web service provider. The STS issues tokens based on its configurations, which model the identity of a given identity provider, and issues tokens to a specific relying party. A security token is a SOAP STS data structure representing a set of claims that assert the identity of a subject. A single claim is identity information, such as a subject's name, age, gender, and email address. A security policy, defined in WS-SecurityPolicy, specifies the required elements, tokens, security bindings, supporting tokens, and protocol assertions, which are requirements for a web service to grant a subject access to its service. The security policy is defined in a WSDL document, which is an XML file that states what needs to be protected, what tokens are allowed for access, and transmission requirements for SOAP STS. REST STS. AM provides a REST STS component that accepts REST API calls to AM to transform security tokens. The AM REST STS allows browser-based clients to use the HTTP protocol methods (GET and POST), cookies, and redirection to authenticate the client with the STS. Note that the REST STS does not conform to the WS-Trust specification, but provides a simpler deployment alternative to SOAP STS for token transformations. SOAP STS. AM provides a WS-Trust 1.4-compliant SOAP STS that lets AM administrators publish or configure security token services. The SOAP STS provides for SOAP-enabled applications to send and receive SOAP messages without the need for HTTP redirection for authentication. REST and SOAP STS: Token Transformations. AM STS issues OpenID Connect V1.0 (OIDC) and SAML V2.0 tokens (bearer, holder-of-key, sender vouches). In both cases, you can invalidate or validate the interim AM session that was created during the authentication of the input token type after the creation of the output token. REST and SOAP STS: Publish Service. You can configure REST or SOAP STS instances using the AM console or programmatically. AM provides a REST STS publish service that allows you to publish these instances using a POST to the endpoints. Note that a published instance can have only a single encryption key. Therefore, you need one published instance per service provider that the web service invoking the STS intends to call. For more information, see "The Publish Service". REST and SOAP STS: Custom SAML Assertion Plugins. AM supports customizable SAML assertion statements. You can create custom plug-ins for Conditions, Subject, AuthenticationStatements, AttributeStatements, and AuthorizationDecisionStatements statements. REST STS: Custom Token Validators and Providers. The AM REST STS provides the ability to customize tokens that are not supported by default by the STS. For example, you can configure STS to transform a token of type CUSTOM to a SAML V2.0 token. SOAP STS: Client SDK. AM provides a SOAP STS client SDK module to allow developers to use Apache CXF-STS classes. For details, see "Consuming SOAP STS Instances Using the SOAP STS Client SDK". SOAP STS: ActAs and OnBehalfOf Elements. AM STS supports delegated and proxied token relationships, as defined by the ActAs and OnBehalfOf elements in WS-Trust, which is available for Username and AM session tokens. SOAP STS: Security Binding Assertions. AM SOAP STS supports the WS-SecurityPolicy binding assertions that protect communication to and from the STS: transport, asymmetric, symmetric. SOAP STS: Custom WSDL. The AM SOAP STS comes with a pre-configured WSDL file. You can customize the policy bindings governing the input or output messages to or from the STS. For specific information, see "Customizing the WSDL File". SOAP STS: Logging Service. The AM STS allows SOAP-STS log entries to be configured via java.util.logging, which allows logging to be configured via the logging.properties file in the Tomcat conf directory. 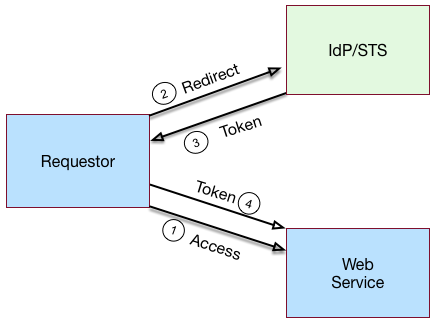 "Basic REST STS Model" illustrates a simple REST STS topology between a requestor, web service, and STS. The STS instance is set up with the identity provider which has an existing trust relationship with the web service. The difference between the REST STS versus the SOAP STS is that REST STS does not strictly follow the WS-Trust specification for input token and output token formats. However, the REST STS provides a simpler means to deploy an STS instance, compared to that of the SOAP STS. A requestor makes an access request to a web resource. The web service redirects the requestor to the STS. The STS validates the signature, decodes the payload, and verifies that the requestor issued the transaction. The STS validates the requestor's credentials, creates an interim AM session, and optionally creates a CTS token for the session. The STS then issues a token to the requestor. If STS is configured to invalidate the interim AM session, it does so. The requestor gets redirected to the web service. The requestor presents the token to the web service. The web service validates the signature, decodes the payload, and verifies that the requestor issued the request. It then extracts and validates the token and processes the request. If a CTS token was created for the session, the web service can call the REST STS to invalidate the token and the corresponding AM session upon request. "Basic SOAP STS Model" illustrates a basic SOAP STS topology between a requestor, web service, and STS. The STS instance is set up with the identity provider which has an existing trust relationship with the web service. A requestor first accesses a protected resource for a web service. The requestor gets the web service's WSDL file, which specifies the policy requirements to access its services. The requestor creates and configures an STSClient object whose main task is to contact the STS. The STSClient contacts the STS to obtain its WSDL file. Each published STS instance exposes an API that is defined in its WSDL file. The WSDL file specifies the security policy bindings, which specify the type of token they must present to the API, and how this token is protected during transit. The STSClient generates and sends a Request for Security Token (RST) to the STS. The RST specifies the what type of token is desired. The requestor's usernameToken is embedded in the SOAP envelope that contains the RST and is used for authentication. The SOAP STS client SDK provides the classes, templates, and documentation to allow developers to set the state necessary to allow the Apache CXF runtime to generate the SOAP envelopt containing the RST, which satisfies the security policy bindings of the targeted STS. The STS validates the requestor's usernameToken, creates an interim AM session, and optionally creates a CTS token for the session. Upon successful authentication, the STS constructs a Request for Security Token Response (RSTR), signs the SAML v2.0 token, and embeds the token within the RSTR. If STS is configured to invalidate the interim token, it does so. The STS sends a Request for Security Token Response (RSTR) to the STSClient. The STSClient extracts the security token and sends it in the request's message header. The STSClient sends the message to the web service. The web service extracts the SAML token and validates the signature to ensure that it came from the STS. The web service allows the user whose ID is specified in the SAML token to access its protected resource. If a CTS token was created for the session, the web service can call the SOAP STS to invalidate the token and the corresponding AM session upon request. AM supports its own REST STS and a WS-Trust 1.4-compliant SOAP STS that transforms tokens from one type to SAML v2.0 or OIDC tokens. The STS can be deployed in existing federated systems to establish cross-domain trust relationships using token transformations. AM provides the ability for AM administrators to publish or configure STS instances, each with its own distinct policy configurations, programmatically or via the AM console. The AM SOAP STS is built upon the Apache CXF STS, an open-source implementation of JAX-WS and JAX-RS, as well as Apache WSS4j, an open-source Java implementation of the WS-Security specification. Issuer. The issuer corresponds to the IdP EntityID. SP EntityID. The SP EntityID is used in the AudienceRestriction element of the Conditions statement of the issued assertion. SP Assertion Consumer Service URL. The SP assertion consumer service URL is used as the Recipient attribute of the subjectConfirmation element in the Subject statement, which is required for bearer assertions according to the Web SSO profile. If assertion signature is configured, the keystore path and password must be specified as well as the alias and password corresponding to the PrivateKey used to sign the assertion. If assertion encryption is configured, the keystore path and password must be specified, as well as the alias corresponding the the SP’s X509Certificate encapsulating the PublicKey used to encrypt the symmetric key used to encrypt the generated assertion. Note that the keystore location can be specified via an absolute path on the local filesystem, or a path relative to the AM classpath. Either the entire assertion can be encrypted, or the NameID and/or AttributeStatement Attributes. All statements constituting a SAML v2.0 assertion can be customized. For each REST STS instance, you can provide custom plug-ins for Conditions, Subject, AuthenticationStatements, AttributeStatements, and AuthorizationDecisionStatements. If you specify the custom plug-ins in the configuration state of the published REST STS instance, the custom classes are consulted to provide the specific statements. See the interfaces in the org.forgerock.openam.sts.tokengeneration.saml2.statements package for details. Note that you can override these default mappings by implementing the org.forgerock.openam.sts.token.provider.AuthnContextMapper interface and specifying the name of this implementation in the configuration of the published REST STS instance. AM allows AM administrators to publish WS-Trust 1.4-compliant STS instances, each with a distinct security policy configuration, and each issuing OpenID Connect (OIDC) v1.0 Tokens or SAML v2.0 (bearer, holder of key, and sender vouches) assertions. The SOAP STS is deployed remotely from AM in a Tomcat or Jetty container. Deploying both the AM .war and the SOAP STS .war in the same container is not supported. The remotely-deployed SOAP STS .war file authenticates to AM with SOAP STS agent credentials and pulls the configuration state for all SOAP instances published in its realm, exposing WS-Trust-compliant SOAP web services based on this configuration state. For more information, see "Implementing SOAP STS Using the AM Console". AM is the authentication authority for the STS instances and its configured data stores, which store the attributes that are included in OIDC tokens and generated SAML v2.0 assertions. Type of supporting token that asserts the caller’s identity. Manner in which the supporting token is protected (symmetric, asymmetric, or transport binding). Transport Binding Assertion. Transport binding is used when the message is protected at the transport level, such as HTTPS, and thus requires no explicit enforcement at the security policy binding enforcement level. The SOAP keystore configuration allows a SOAP STS instance to be published referencing the keystore state necessary to enforce the symmetric and asymmetric bindings. Symmetric Binding Assertion. Symmetric binding is used when only one party needs to generate security tokens. In a symmetric binding, the client generates symmetric key state used to sign and encrypt messages, and encrypts this symmetric key state with the STS’s public key, and includes the encrypted symmetric key in the request. Thus, the SOAP keystore configuration of a published STS instance, which is protected by the symmetric binding, must reference a keystore with the STS's PrivateKeyEntry, so that it may decrypt the symmetric key generated by the client. Asymmetric Binding Assertion. Asymmetric binding is used when both the client and the service both have security tokens. In an asymmetric binding, client requests are signed with the client’s secret key, and encrypted with the STS’s public key. STS responses are signed with the STS’s private key and encrypted with the client’s public key. The client's X.509 certificate is included in the request, so that the STS can validate the client's signature and encrypt responses to the client without requiring the presence of the client's X.509 certificate in the STS's keystore. However, the SOAP keystore configuration of a published STS instance protected by an asymmetric binding must reference a keystore with the STS's PrivateKeyEntry, which allows the STS to both: 1) sign messages from STS to client, and 2) decrypt messages from the client. The Decryption Key Alias in a SOAP STS instance's configuration corresponds to the PrivateKeyEntry. A SAML v2.0 assertion, defined in SAML V2.0, contains a Subject element that identifies the principal, which is the subject of the statements in the assertion. The Subject element contains an identifier and zero or more SubjectConfirmation elements, which allows a relying party to verify the subject of the assertion with the entity with whom the relying party is communicating. Holder of Key. The holder of key subject confirmation method involves proving a relationship between the subject and claims. This is achieved by signing part of the SOAP message with a proof key sent in the SAML assertion. The additional proof key guards against any attempted man-in-the-middle attack by ensuring that the SAML assertion comes from the subject claiming to the be requestor. Sender Vouches. The sender vouches subject confirmation method is used in cases where you have a proxy gateway that propagates the client identity via the SOAP messages on behalf of the client. The proxy gateway must protect the SOAP message containing the SAML assertion, so that the web service can verify that it has not been tampered with. Bearer. The bearer subject confirmation method assumes that a trust relationship exists between the subject and the claims, and thus no keys are required when using a bearer token. No additional steps are required to prove or establish a relationship. Since browser-based clients use bearer tokens and no keys are required, you must protect the SOAP message using a transport-level mechanism, such as SSL, as this is the only means to protect against man-in-the-middle attacks. SOAP STS supports the ability to issue SAML assertions with the sender vouches subject confirmation method. Sender vouches are used in proxy deployments, such as a proxying gateway, where the gateway requests a SAML assertion with a sender vouches confirmation from the STS. In this case, the requestor's credentials are set in the OnBehalfOf and ActAs elements in the request security token (RST) request included in the Issue invocation. The gateway calls the STS, and the gateway’s credentials satisfy the security policy bindings protecting the STS. The presence of either the OnBehalfOf and ActAs elements together with a token type of SAML v2.0 and a key type of PublicKey triggers the issuance of a sender vouches SAML v2.0 assertion. The STS runs token validators that validate the authenticity of the ActAs or OnBehalfOf token. The SOAP STS configuration indicates whether token delegation relationships are supported in the STS in the ActAs and OnBehalfOf elements. If token delegation is supported, the configuration also indicates the token types that token validators use to validate the ActAs and OnBehalfOf token elements. In the Request for Security Token (RST) invocation, Username and AM tokens are supported for the OnBehalfOf element. In addition, you can specify that the SOAP STS instance be deployed with a user-specified implementation of the token delegation handler interface, org.apache.cxf.sts.token.delegation.TokenDelegationHandler. The Delegation Relationships Supported property. One or more Delegated Token types. For example, AM or Username for which token validators are deployed to validate the ActAs or OnBehalfOf tokens and/or a custom token delegation handler. If you configure the Username token type as a delegated token type, AM uses the configuration in the Authentication Target Mappings property to authenticate Username tokens. AM SSO tokens require no special configuration in the Authentication Target Mappings property. Suppose you want to deploy the SOAP STS to receive requests from a proxy gateway and issue SAML v2.0 assertions with sender vouches subject confirmation method. The gateway sends the SAML v2.0 assertion that asserts the identity of the gateway client and vouches for its identity. Suppose the SOAP STS deployment has a security policy binding requiring the presentation of an X.509 certificate. This security policy binding can be satisfied by presenting the gateway's X.509 certificate. However, the SOAP STS-issued SAML v2.0 assertion should assert the identity of the gateway client that presents its identity to the gateway as either a <username, password> combination or as an AM session. In this case, the published SOAP STS would specify an X.509-based security policy, the delegation relationships to be supported, and whether both AM and Username token types should be supported. No custom token delegation handler need be specified. Furthermore, the SOAP STS instance must be published with Authentication Target Mappings that specify how the Username token should be presented to AM's RESTful authentication context. The gateway code would then create a request for security token (RST) invocation using the classes in the openam-sts/openam-soap-sts/openam-soap-sts-client module, and include the gateway client's <username, password> or AM session state as the OnBehalfOf element. This setting allows the gateway to consume the SOAP STS to issue SAML v2.0 assertions with the sender vouches subject confirmation method, which asserts the identity of the gateway client corresponding to the presented <username, password> or AM session state. If, at a later date, you want to exclude or blacklist some users from attaining SAML v2.0 assertions, regardless of their possession of valid <username, password> or AM session state, you can update the SOAP STS with the class name of a token delegation handler implementation, which would implement this blacklist functionality. The SOAP STS .war file would have to be re-created with this file in the classpath. The token delegation handler could reject the invocation for users or principals on the blacklist. STS token transformations validate input tokens before generating output tokens. STS uses AM authentication modules and chains to perform token validation. When deploying STS, you must configure AM authentication so that it can validate input tokens. This section describes authentication configuration requirements for username, X.509, and OpenID Connect tokens. No special authentication configuration is required when using AM session tokens as the input tokens in token transformations. Because REST STS instances are not part of a secure framework like WS-Trust 1.4, this section also mentions security issues you should consider when sending tokens across a network to a REST STS instance. In addition to configuring AM authentication to support input token validation, you must identify the authentication module or chain to be used to validate each input token type. To do so, configure the Authentication Target Mappings property in the STS instance configuration. For more information about this property, see "Reference". Username tokens passed to REST STS instance contain the username/password combination in cleartext. Tokens can be validated using any module type that supports username/password authentication, including Data Store, LDAP, and so forth. With usernames and passwords in cleartext, be sure to configure your deployment with an appropriate level of security. Deploy REST STS instances that support input username token transformations on TLS. From the header key defined in the REST STS instance's Client Certificate Header Key property. In this case, STS also confirms that the request came from a host specified in the Trusted Remote Hosts property. From the javax.servlet.request.X509Certificate attribute in the ServletRequest. The REST STS instance obtains the X.509 certificate from the ServletRequest if no header key is configured in the Client Certificate Header Key property. The AM Certificate module authenticates the X.509 certificate input token. The module optionally performs certificate revocation list (CRL) or Online Certificate Status Protocol (OCSP) checking, and can optionally check to see that the specified certificate is in a LDAP datastore. If certificates are passed to REST STS using HTTP headers, you must configure the Trusted Remote Hosts and Http Header Name for Client Certificate properties in the Certificate module to match your REST STS instance's configuration. To validate OpenID Connect input tokens, a REST STS instance must reference an OpenID Connect id_token bearer authentication module in the Authentication Target Mappings property. Specify a header in the Name of header referencing the ID Token property. The REST STS instance's Target Authentication Mapping property must reference the same header. Specify the issuer name in the Name of OpenID Connect ID Token Issuer property, and configure the token issuer's discovery URL, JWK URL or client secret in the OpenID Connect validation configuration value property. If incoming OpenID Connect tokens contain azp claims, specify valid claims in the "List of accepted authorized parties" property. If incoming OpenID Connect tokens contains aud claims, specify the valid claim in the Audience property. Configure attribute mappings so that JWK claims map to attributes in the AM user store. For more information about OpenID Connect id_token bearer authentication module properties, see "OpenID Connect id_token bearer Module" in the Authentication and Single Sign-On Guide. SOAP STS instances do not accept OpenID Connect tokens as input tokens in token transformations. For example, you can convert a Google-issued OIDC to an AM STS-issued OIDC. This chapter covers implementation of AM's REST and SOAP STS components. "Implementing REST STS Using the AM Console"
"Implementing SOAP STS Using the AM Console"
To implement the REST STS using the AM console, add one or more REST STS instances to your AM deployment. To configure a REST STS instance using the AM console, navigate to Realms > Realm Name > STS > REST STS Instances, and then click Add. See "REST STS Configuration Properties" for detailed information about STS configuration properties. You can also configure a REST STS instance programmatically. See "Publishing REST STS Instances" for more information. The SOAP STS is deployed remotely from AM in a Tomcat or Jetty container. The remotely-deployed SOAP STS .war file authenticates to AM with SOAP STS agent credentials and pulls the configuration state for all SOAP instances published in its realm, exposing WS-Trust-compliant SOAP web services based on this configuration state. This section describes the process for deploying SOAP STS instances. To deploy a SOAP STS instance, you create an agent that the SOAP STS deployment uses to authenticate to AM, then configure the instance, prepare a deployment directory, run a wizard to package the instance into a .war file, and deploy the .war file into a web container. When multiple SOAP STS instances are configured in the same realm, the SOAP STS deployment created by the wizard supports all of the realm's SOAP STS instances. Their configurations are packaged together into a single .war file, and they use the same agent to authenticate to AM. In order to access AM to perform these tasks, SOAP STS deployments need an identity that they can use to authenticate to AM before they can request AM services. SOAP STS deployments use an agent identity to authenticate to AM. Note that even if you have multiple SOAP STS instances in a deployment, you need only a single agent identity for the entire deployment, and not one agent identity per SOAP STS instance. Navigate to Realms > Realm Name > Applications > Agents > SOAP STS Agent. Click New to create a new agent. Specify an agent name and password. The Poll Interval property soecifies how often the SOAP STS deployment contacts AM to obtain changes to the configuration of SOAP STS instances published in the SOAP STS deployment. Polling AM enables the SOAP STS deployment to detect configuration changes to SOAP STS instances, deletion of SOAP STS instances in the deployment, and the addition of new SOAP STS instances to the deployment. In a subsequent step in the deployment process, you run the Create a Soap STS Deployment wizard. The wizard prompts you to provide the SOAP STS agent name and password, and then configures the SOAP STS deployment to use the agent identity to authenticate to AM. To configure a new SOAP STS instance using the AM console, navigate to Realms > Realm Name > STS > SOAP STS Instances, and then click Add. See "SOAP STS Configuration Properties" for detailed information about STS configuration properties. You can also configure a SOAP STS instance programmatically. See "Publishing SOAP STS Instances" for more information. Before you can run the Create a SOAP STS Deployment wizard, which creates a .war file for the SOAP STS instance, you must prepare a directory with content that the wizard uses as input. If you have not already done so, download the git repository containing the AM source code. You can find information about downloading and compiling the AM source code on the ForgeRock website. The website also lists prerequisites for compiling the source code. Make sure that your system meets these prerequisites before proceeding. Check out the tag in the source code repository for this release of AM. If you specified custom WSDL files in the SOAP STS instance configuration for one or more SOAP STS instances in the realm, copy all of the custom WSDL files to the /path/to/openam/soapstsdeployment directory. Custom WSDL files are specified under Custom wsdl File. For more information about custom WDSL files in a SOAP STS deployment, see "Customizing the WSDL File". After you have prepared the deployment directory, you are ready to run the wizard that creates a SOAP STS deployment .war file. In the AM console, navigate to Realms > Realm Name > Dashboard, where Realm Name is the realm in which you configured one or more SOAP STS instances. Click Create a Soap STS Deployment. The Common Tasks > Create a Soap STS Deployment page appears. Click Create a Soap STS Deployment again. The Configure a Soap STS Deployment page appears. The realm in which you have configured one or more SOAP STS instances. AM's deployment URL. For example, https://openam.example.com:8443/openam. The agent name and password that you defined when you created the SOAP STS agent. Creating the SOAP STS agent is described in "Creating a SOAP STS Agent". The file names of all custom WSDL files that are defined in the SOAP STS instance configurations in the realm. All the files that you specify in this field should have been copied to the /path/to/openam/soapstsdeployment directory when you prepared the deployment directory. The file names of all keystores that are defined in the SOAP STS instance configurations in the realm. All the files that you specify in this field should have been copied to the /path/to/openam/soapstsdeployment directory when you prepared the deployment directory. If the wizard runs successfully, a message appears letting you know that AM successfully created a SOAP STS deployment .war file named deployable-soap-sts-server_timestamp.war. in the /path/to/openam/soapstsdeployment directory. If the wizard does not run successfully, correct the error and rerun the wizard. Token delegation handlers that validate credentials set in ActAs and OnBehalfOf elements of request security tokens. Customized token delegation handlers are configured under Realms > Realm Name > STS > SOAP STS Instances > Instance Name > Deployment > Custom Delegation Handlers. Classes that override the default AuthnContext strings included in generated SAML v2.0 assertions. These classes are configured under Realms > Realm Name > STS > SOAP STS Instances > Instance Name > Issued SAML2 Token Configuration > Custom Authentication Context Class Name. Classes that provide acr claims in generated OpenID Connect tokens. These classes are configured under Realms > Realm Name > STS > SOAP STS Instances > Instance Name > OpenIdConnect Token Configuration > Custom authn context mapper class. Classes that provide amr claims in generated OpenID Connect tokens. These classes are configured under Realms > Realm Name > STS > SOAP STS Instances > Instance Name > OpenIdConnect Token Configuration > Custom authn methods references mapper class. To include any of the preceding customizations in a SOAP STS deployment, bundle the customized classes into the SOAP STS deployment .war file under deployment-context/WEB-INF/classes. After you run the Create a Soap STS Deployment wizard, you deploy the SOAP STS .war file created by the wizard to a web container. Install an instance of one of these web containers for the SOAP STS deployment, making sure the port numbers you specify in the web container's configuration do not conflict with any active ports on the host on which you will run the web container. Simplifying the .war file name eliminates web container startup errors that occur when the file name contains certain characters. Start the SOAP STS deployment web container. Review the web container's log file for errors. If errors are detected, correct the errors and restart the web container. If you want to verify that the SOAP STS agent successfully connects to AM, enable message-level debug logging on AM, and then restart the SOAP STS deployment web container. For details about how to enable message-level debug logging, see "Debug Logging" in the Setup and Maintenance Guide. Review the Session debug log. You should see entries in the log that demonstrate that the SOAP STS agent successfully authenticated to AM, and that the agent has a session with AM. When you have finished verification, remember to turn off message-level debugging. You can publish SOAP STS instances that reference a custom WSDL file. The custom WSDL can also contains a user-entered port and service QNames (qualified names), which reference the to-be-exposed port and service defined in the WSDL file. You can customize the WSDL files, which must be diffs of the existing WSDL files defined in openam-sts/openam-soap-sts/openam-soap-sts-server/src/main/resources. You can copy the Binding element in the specification of one WSDL file into another, so that a SOAP STS instance can be published and protected by two policy bindings. In other words, the ExactlyOne element of a given policy can have two binding definitions, so that the satisfaction of either will allow access to the SOAP STS. You can customize the Policy bindings governing the input or output messages to or from the SOAP STS instance. The existing set of security policy bindings specified in the pre-configured WSDL files are taken from Apache CXF-sanctioned definitions, and thus are correctly realized by Apache CXF/WSS4J. Any deviations from the standard definitions specified in the WSDL files in the AM code base at openam-sts/openam-soap-sts/openam-soap-sts-server/src/main/resources other than those specified above will not be supported. AM SOAP STS logs to the Simple Logging Facade for Java (SLF4J) API. Because the Apache CXF framework, by default, logs to the java.util.logging object, the AM SOAP STS is built with a maven dependency upon slf4j-jdk14, which allows AM SOAP STS log entries to be configured via java.util.logging. As a result, you can implement both AM SOAP STS and Apache CXF logging to be configured via the logging.properties file in the Tomcat conf directory. Because the AM SOAP STS code logs to the SLF4J API, the manner in which these logs are realized is a function of the jar file state bundled in the AM SOAP STS server .war file. If you implement the AM SOAP STS logs using a different framework, you can replace the slf4j-jdk14 Maven dependency in the AM SOAP STS server pom.xml file by the desired dependency and rebuild the .war file. Or you can change the generated AM SOAP STS server .war file to include the desired .jar file, which will realize the SLF4J API with the desired logging framework. Also, note that the debugfiles.properties included in the AM SOAP STS server .war file does not configure logging. It is present only because some AM code leveraged by the SOAP STS continues to have dependencies upon the legacy, AM debug logger. The presence of this file minimizes the number of harmless error logs generated by the initialization of this legacy debug logger. AM SOAP STS does not utilize this logger. "Querying, Validating, and Canceling Tokens"
If you have not already done so, download and build the STS samples. For information on downloading and building AM sample source code, see How do I access and build the sample code provided for OpenAM 12.x, 13.x and AM (All versions)? in the Knowledge Base. You can find the STS code examples under /path/to/openam-samples-external/sts-example-code. You configure STS instances to perform one or more token transformations. Each instance provides configuration details about how SAML v2.0 and/or OpenID Connect output tokens are encrypted or signed. Deployments that support multiple SAML v2.0 and/or OpenID Connect service providers require multiple STS instances. Publishing an STS instance means creating an STS instance with a given configuration. AM supports two types of STS instances: REST STS instances and SOAP STS instances. REST STS instances provide token transformations by letting users call REST API endpoints, while SOAP STS instances provide token transformations by letting users call WS-Trust 1.4-compliant SOAP endpoints. "Implementing STS Using the AM Console" describes how to create and configure STS instances by using the AM console. This section covers how to publish STS instances programmatically. When you publish a REST STS instance, AM exposes a REST endpoint for accessing the instance, and the instance is immediately available for use to callers. For SOAP STS instances, there is an additional deployment step. In order for the SOAP endpoint to be exposed, a SOAP STS deployment must exist for the realm in which the SOAP STS instance was created. A SOAP STS deployment is a running web application separate from AM. For information about creating SOAP STS deployments, see "Implementing SOAP STS Using the AM Console". Specify the _action=create parameter in the URL. The instance_state object in the JSON payload represents the STS instance's configuration. For a complete example of an instance_state object, see the sample code for the RestSTSInstancePublisher class in "Publishing REST STS Instances". Accessing the sts-publish endpoint requires administrative privileges. Authenticate as an AM administrative user, such as amadmin, before attempting to publish an STS instance. In the preceding examples, deployment-URL-element is the value of the STS instance's deployment URL element—one of the instance's configuration properties. realm is the realm in which a SOAP STS instance has been configured. The sample code referenced in this section provides an example of how to programmatically publish REST STS instance. The code is not intended to be a working example. Rather, it is a starting point—code that you can modify to satisfy your organization's specific requirements. To access the sample code, see "To Access the STS Example Code". After publishing a REST STS instance programmatically, you can view the instance's configuration in the AM console. The instance is ready for consumption. The RestSTSInstancePublisher class exposes an API to publish, delete, and update REST STS instances by calling methods that perform an HTTP POST operation on the soap-sts/publish endpoint. The RestSTSInstancePublisherclass calls the RestSTSInstanceConfigFactory class to create a RestSTSInstanceConfig instance. RestSTSInstanceConfig objects encapsulate all the configuration information of a REST STS instance, and emit JSON values that you can post to the sts-publish/rest endpoint to publish a REST STS instance. The sample STSPublishContext class specifies the configuration necessary to publish REST and SOAP STS instances. The class provides a programmatic method for setting configuration properties—the same configuration properties available through the AM console under Realms > Realm Name > STS. The sample CustomTokenOperationContext class specifies custom validators, token types, and transformations that a REST STS instance can support. The sample code referenced in this section is not compilable, because it uses classes that are not available publicly. The code provides patterns to developers familiar with the problem domain and is intended only to assist developers who want to programmatically publish REST STS instances. The sample code imports a number of classes, introducing dependencies. Classes imported from the AM client SDK can remain in your code, but other imported classes must be removed and replaced with code that provides similar functionality in your environment. For example, the RestSTSInstanceConfigFactory class uses a constant named CommonConstants.DEFAULT_CERT_MODULE_NAME from the imported com.forgerock.openam.functionaltest.sts.frmwk.common.CommonConstants utility class. This utility class is not publicly available. Therefore, you need to replace this constant with another construct. The critical part of the sample code is the idioms that programmatically set all the state necessary to publish a REST STS instance. The sample code referenced in this section provides an example of how to programmatically publish of a SOAP STS instance. The code is not intended to be a working example. Rather, it is starter code that you can modify to satisfy your organization's specific requirements. To access the sample code, see "To Access the STS Example Code". After publishing a SOAP STS instance programmatically, you can view the instance's configuration in the AM console. However, the instance is not ready for consumption until after you have created and deployed a SOAP STS .war file. For information about how to create and deploy a SOAP STS .war file, see "Implementing SOAP STS Using the AM Console"." The sample SoapSTSInstancePublisher class exposes an API to publish, delete, and update SOAP STS instances by calling methods that perform an HTTP POST operation on the soap-sts-publish/publish endpoint. The sample SoapSTSInstancePublisher class calls the SoapSTSInstanceConfigFactory class to create a SoapSTSInstanceConfig instance. SoapSTSInstanceConfig objects encapsulate all the configuration information of a SOAP STS instance, and emit JSON values that you can post to the soap-sts-publish/publish endpoint to publish a REST STS instance. The sample SoapSTSServerCryptoState class specifies the configuration for the keystore used by a SOAP STS instance. The class provides a programmatic method for setting configuration properties—the same configuration properties available through the AM console under Realms > Realm Name > STS > Soap Keystore Configuration. The sample code referenced in this section is not compilable, because it uses classes that are not available publicly. The code provides patterns to developers familiar with the problem domain and is intended only to assist developers who want to programmatically publish SOAP STS instances. The sample code imports a number of classes, introducing dependencies. Classes imported from the AM client SDK and the SOAP STS client SDK can remain in your code, but other imported classes must be removed and replaced with code that provides similar functionality in your environment. For example, the SoapSTSInstanceConfigFactory class uses a constant named CommonConstants.DEFAULT_CERT_MODULE_NAME from the imported com.forgerock.openam.functionaltest.sts.frmwk.common.CommonConstants utility class. This utility class is not publicly available. Therefore, you need to replace this constant with another construct. The critical part of the sample code is the idioms that programmatically set all the state necessary to publish a SOAP STS instance. Developers access REST STS instances by making REST API calls that support token transformations. Developers access SOAP STS instances by sending SOAP messages or by using the SOAP STS client SDK. AM's SOAP STS is WS-Trust 1.4 compliant. You consume a REST STS instance by sending REST API calls to the instance's endpoint. For example, a REST STS instance configured in the realm myRealm with the deployment URL element username-transformer exposes the endpoint /rest-sts/myRealm/username-transformer. Requires the username and password properties. Requires the session_id property, with an SSO token as its value. No properties are required, because input X.509 tokens are presented either in HTTP headers or by using TLS. For more information about X.509 tokens, see the configuration details for the Authentication Target Mappings and Client Certificate Header Key properties in "REST STS Configuration Properties". Requires the oidc_id_token property, with the OpenID Connect token as its value. Requires the subject_confirmation property, the value of which determines the <saml:ConfirmationMethod> element for the generated SAML v2.0 assertion. Valid values are BEARER, SENDER_VOUCHES, and HOLDER_OF_KEY. When generating an assertion with a holder-of-key subject confirmation method, the proof_token_state property is required. The value for this property is an object that contains the base64EncodedCertificate property. Requires the nonce and allow_access properties. For more examples of JSON payloads that you can send to REST STS instances, see the comments in the sample code in "Java Example". You can use the curl command to quickly verify that a published REST STS instance operates as expected. The iPlanetDirectoryPro header is required and should contain the SSO token of an administrative user, such as amAdmin, who has access to perform the operation. The RestSTSConsumer.java sample code provides an example of how to consume a published REST STS instance programmatically. Tailor this example as required to provide programmatic consumption of your own REST STS instances. To access the sample code, see "To Access the STS Example Code". The sample code referenced in this section is not compilable, because it uses classes that are not available publicly. The code provides patterns to developers familiar with the problem domain and is intended only to assist developers who want to programmatically consume REST STS instances. You consume a SOAP STS instance by sending it SOAP messages to the instance's endpoint, or by calling it using the AM SOAP STS client SDK. The SOAP STS deployment context comprises the base URL of the web container to which the SOAP STS .war file is deployed and the deployment web application name. For more information about SOAP STS deployments, see "Implementing SOAP STS Using the AM Console". For example, a SOAP STS instance configured in the realm myRealm with the deployment URL element soap-username-transformer and the a deployment web application name openam-soap-sts would expose a URL similar to https://soap-sts-host.com:8443/openam-soap-sts/sts/myRealm/soap-username-transformer. The WSDL for the service would be available at https://soap-sts-host.com:8443/openam-soap-sts/sts/myRealm/soap-username-transformer?wsdl. Because an AM SOAP STS instance is a WS-Trust 1.4-compliant security token service, users can consume the instance by sending it standard WS-Trust 1.4 SOAP STS framework messages, such as RequestSecurityToken messages, passed as the payload to WSDL ports that are implemented by the security token services. For more information about WS-Trust 1.4 security token services, see the WS-Trust 1.4 specification. You can consume an AM SOAP STS instance by calling it using the AM SOAP STS client SDK. The SOAP STS client SDK is based on classes in Apache CXF, an open source service framework. Apache CXF provides the org.apache.cxf.ws.security.trust.STSClient class, which encapsulates consumption of a SOAP STS service. However, using this class requires considerable expertise. The org.forgerock.openam.sts.soap.SoapSTSConsumer class in the AM SOAP STS client SDK wraps the Apache CXF class org.apache.cxf.ws.security.trust.STSClient, providing a higher level of abstraction that makes consumption of SOAP STS instances easier to achieve. The SoapSTSConsumer class' issueToken, validateToken, and cancelToken methods provide the three fundamental operations exposed by SOAP STS instances. Supporting classes facilitate the creation of state necessary to invoke these methods. Classes in the SDK provide logic to allow AM session tokens to be presented in order to satisfy the security policy bindings that mandate AM sessions as supporting tokens. The STS client obtains secret password state—keystore entry passwords and aliases, username token credential information, and so forth—from a callback handler. The SoapSTSConsumerCallbackHandler class provides the means to create a callback handler initialized with state that will be encountered when consuming SOAP STS instances. The SoapSTSConsumerCallbackHandler instance can be passed to an STS client. The TokenSpecification class provides a way to create the varying token state necessary to obtain specific tokens and create any necessary supporting state. You can use the classes in the SOAP STS client SDK as is, or you can tailor them to your needs. For more information about the SOAP STS client SDK classes, see the source code and the Javadoc. The SOAP STS client SDK is not part of the AM client SDK. To use the SOAP STS client SDK, you must compile the source code for the SOAP STS client SDK and create a .jar file. Download the AM source code. Change to the openam-sts/openam-soap-sts directory. Run the mvn install command. Locate the openam-soap-sts-client-5.1.jar file in the openam-sts/openam-soap-sts/openam-soap-sts-client/target directory. Both REST and SOAP STS instances support token persistence, which is the ability to store tokens issued for the STS instance in the Core Token Service (CTS). You enable token persistence for both REST and SOAP STS instances' configuration under Realms > Realm Name > STS > STS Instance Name > General Configuration > Persist Issued Tokens in Core Token Store. Tokens are saved in the CTS for the duration of the token lifetime, which is a configuration property for STS-issued SAML v2.0 and OpenID Connect tokens. Tokens with expired durations are periodically removed from the CTS. Querying tokens means listing tokens issued for an STS instance or for a user. Validating a token means verifying that the token is still present in the CTS. Cancelling a token means removing the token from the CTS. The sts-tokengen endpoint provides administrators with the ability to query and cancel tokens issued for both REST and SOAP STS instances using REST API calls. When using the sts-tokengen endpoint, be sure to provide the token ID for an AM administrator, such as amadmin, as the value of a header whose name is the name of the SSO token cookie, by default iPlanetDirectoryPro. List tokens issued for an STS instance by using the queryFilter action in an HTTP GET call to the sts-tokengen endpoint with the /sts-id argument. List tokens issued for a particular user with the queryFilter action in an HTTP GET call to the sts-tokengen endpoint with the /token-principal argument. "result":"token with id B663D248CE4C3B63A7422000B03B8F5E0F8E443B successfully removed." REST STS users can validate and cancel tokens by making an HTTP POST call to a REST STS instance's endpoint. The source code for the validateToken and cancelToken methods in the org.forgerock.openam.sts.soap.SoapSTSConsumer class provides information needed to construct WS-Trust 1.4-compliant calls for validating and cancelling tokens. Locate the org.forgerock.openam.sts.soap.SoapSTSConsumer class under openam-sts/openam-soap-sts/openam-soap-sts-client in the AM source code. The SOAP STS client SDK has a dependency on Apache CXF classes, which is not present in the AM client SDK. Therefore, the two SDKs are not bundled together. This chapter covers customizing AM's support for the Security Token Service. "Extending STS to Support Custom Token Types"
Several sections in this chapter reference STS code examples. To access the example code, see "To Access the STS Example Code". AM supports token transformations to and from a variety of token types, including username, SAML v2.0, OpenID Connect, and X.509. In addition to these supported token types, REST STS instances can use custom token types as the input or output token, or both, in a token transformation. When you configure a REST STS instance to support a token transformation that takes a custom token type, you can also configure a custom validator and provider class for the custom token type. AM uses custom validator classes to validate custom tokens and custom provider classes to produce custom tokens. Specify custom token validator and provider classes in the AM console by configuring the Custom Token Validators and Custom Token Providers properties under Realms > Realm Name > STS > REST STS Instance Name. A custom validator class can be used in transformations that produce standard STS output tokens, such as SAML v2.0 tokens or OpenID Connect tokens, and in transformations that produce custom output token types. A custom provider class can be used in token transformations that take standard STS input tokens, such as username tokens or AM SSO tokens, and in transformations that take custom input token types. Before a REST STS instance can use a custom token type validator or provider class, you must bundle the class into the AM .war file and restart AM. AM invokes a single instance of a validator or provider class to run all concurrently dispatched token transformations that use the custom token type. Because there is only a single instance of the class, you must code custom validator and provider classes to be thread-safe. To create a custom token type validator class, implement the org.forgerock.openam.sts.rest.token.validator.RestTokenTransformValidator class. Custom token type validator classes implement the validateToken method. This method takes a RestTokenValidatorParameters object as input. Note that the generic type of RestTokenValidatorParameters is org.forgerock.json.fluent.JsonValue. As a result of using this type, custom validator classes can access the JSON representation of the input token passed to the REST STS instance in the input_token_state JSON key. The validateToken method returns an org.forgerock.openam.sts.rest.token.validator.RestTokenTransformValidatorResult object. At a minimum, this object contains the AM SSO token corresponding to the validated principal. It can also contain additional information specified as a JSON value, allowing a custom validator to pass extra state to a custom provider in a token transformation. To create a custom token type provider class, implement the org.forgerock.openam.sts.rest.token.provider.RestTokenProvider class. The createToken method returns a string representation of the custom token in a format that can be transmitted across HTTP in JSON. It should be base64-encoded if binary. This section provides an example of how to use custom token type validators and providers. The principal returned by the USERNAME token validator: unt_user17458687. The AM SSO token corresponding to this authenticated principal. Additional state returned by the token validator, if any. Because the USERNAME token validator does not return any additional state, the additional state for this example would be null. The input to the custom validator and provider would be similar to the preceding examples, with the possible addition of any additional state that the custom validator returned from the validateToken method. This reference section covers configuration settings for AM's Security Token Service. Specifies whether to enable token persistence in the Core Token Service (CTS). AM saves all STS-issued tokens to CTS when token persistence is enabled. A token's lifetime in CTS has the same length as the Token Lifetime property specified for issued tokens. STS token validation and cancellation capabilities require tokens to be present in CTS. Therefore, if your deployment requires token validation and cancellation, you must enable token persistence. Specifies one or more token transformations supported by this REST STS instance. Token transformations are listed in the AM console using the notation input_token_type -> output_token_type. For each supported token transformation, AM provides an option to invalidate the interim AM session. When transforming a token, the STS creates an AM session. If desired, you can invalidate the AM session after token transformation is complete. Specifies a validator class for a custom token type. Use the format CUSTOM_TOKEN_TYPE|custom_validator_class to specify each validator class. For example, CUSTOM|org.mycompany.tokens.myCustomTokenValidator. For more information about custom token validators, see "Extending STS to Support Custom Token Types". Specifies a provider class for a custom token type. Use the format CUSTOM_TOKEN_TYPE|custom_provider_class. To specify each provider class. For example, CUSTOM|org.mycompany.tokens.myCustomTokenProvider. For more information about custom token providers, see "Extending STS to Support Custom Token Types". Specifies one or more token transformations that take a custom token type as the input or output token. If you specify a custom token validator or provider, you must also specify a custom token transform. Whether to invalidate the AM session created during token transformation. Specify TRUE to invalidate the session or FALSE to let the session remain valid. For example, a value of CUSTOM|SAML2|TRUE configures a token transformation that transforms a CUSTOM token to a SAML v2.0 assertion and then invalidates the created AM session. Specifies a string that identifies this REST STS instance. The Deployment Url Element is a component of the REST STS instance's endpoint. For example, if you specified myRESTSTSInstance as the Deployment Url Element, the REST STS endpoint would be rest-sts/myRealm/myRESTSTSInstance. Specifies one or more mappings that define how the REST STS instance authenticates input tokens. (Required) The input token type: USERNAME, OPENAM, X509, OPENIDCONNECT, or a custom token type. (Required) The value service or module. If the third argument is an authentication chain, specify service. If the third argument is an authentication module, specify module. (Required) The name of an AM authentication chain or module to which the input token is authenticated. For X509 input tokens, the format is x509_token_auth_target_header_key=Header Name. For OPENIDCONNECT input tokens, the format is oidc_id_token_auth_target_header_key=Header Name. Be sure to specify the header names configured in the Certificate or OpenID Connect id_token bearer authentication module properties as the Header Name argument. This argument can also be used with custom token types to specify the name of a header or cookie from which to obtain a token. When using this argument with a custom token type, its format is determined by the custom validator class that validates the custom token type. USERNAME|service|myLDAPChain configures STS to authenticate input USERNAME tokens to the myLDAPChain authentication chain. X509|module|CertModule|x509_token_auth_target_header_key=ClientCert configures STS to obtain an X.509 certificate from the ClientCert header, use it as the input token, and authenticate it using the CertModule authentication module. Specifies the name of a header that a TLS offloader should use to use to transmit client certificates. Token transformations that take an X.509 certificate as the input token require the certificate to be presented using two-way TLS, so that the TLS handshake can validate client certificate ownership. A common way of obtaining the client certificate with two-way TLS is to use the javax.servlet.request.X509Certificate attribute in the servlet request. However, in deployments with TLS offloading, the offloader must use an HTTP header to transmit the certificate to its destination. This configuration property is the name of the HTTP header whose value contains the certificate. Specifies one or more IP addresses of hosts trusted to transmit client X.509 certificates in deployments with TLS offloading. To allow any host to transmit a certificate, specify any as the value of this property. As with the Client Certificate Header Key property, configure this property for deployments with TLS offloading. Properties that determine content in STS-issued SAML v2.0 assertion. For information about SAML v2.0 assertions, see Assertions and Protocols for the OASIS Security Assertion Markup Language (SAML) V2.0. Properties that determine how the issued SAML v2.0 assertion is signed or encrypted. Specifies the IdP entity ID. Populates the Issuer element of the SAML v2.0 assertion. Specifies an audience attribute value. Populates the AudienceRestriction subelement of the Conditions element of the SAML v2.0 assertion. This value is required when issuing Bearer assertions. Specifies a recipient attribute value. Populates the Recipient subelement of the SubjectConfirmation element of the SAML v2.0 assertion. Specifies the name identifier format for the SAML v2.0 assertion. Specifies the lifetime, in seconds, for the assertion. The default is 600 seconds. Specifies the name of a custom class that generates a Conditions element in the SAML v2.0 assertion. This property is optional: use a custom class when the Conditions element created by the default provider does not meet your needs. The class must implement the org.forgerock.openam.sts.tokengeneration.saml2.statements.ConditionsProvider interface, and must be bundled in the AM .war file. Specifies the name of a custom class that generates a Subject element in the SAML v2.0 assertion. This property is optional: use a custom class when the Subject element created by the default provider does not meet your needs. The class must implement the org.forgerock.openam.sts.tokengeneration.saml2.statements.SubjectProvider interface and must be bundled in the AM .war file. Specifies the name of a custom class that generates an AuthnStatement element in the SAML v2.0 assertion. This property is optional: use a custom class when the AuthnStatement element created by the default provider does not meet your needs. The class must implement the org.forgerock.openam.sts.tokengeneration.saml2.statements.AuthenticationStatementsProvider interface and must be bundled in the AM .war file. Specifies the name of a custom class that generates an AttributeStatement element in the SAML v2.0 assertion. This property is optional: use a custom class when the AttributeStatement element created by the default provider does not meet your needs. The class must implement the org.forgerock.openam.sts.tokengeneration.saml2.statements.AttributeStatementsProvider interface and must be bundled in the AM .war file. Specifies the name of a custom class that generates an AuthzDecisionStatement element in the SAML v2.0 assertion. This property is optional: use a custom class when the AuthzDecisionStatement element created by the default provider does not meet your needs. The class must implement the org.forgerock.openam.sts.tokengeneration.saml2.statements.AuthzDecisionStatementsProvider interface and must be bundled in the AM .war file. Specifies the name of a custom attribute mapper class. An attribute mapper generates attribute elements to be included in the SAML v2.0 assertion. The class must implement the org.forgerock.openam.sts.tokengeneration.saml2.statements.AttributeMapper interface and must be bundled in the AM .war file. Specifies the name of a custom class that generates an AuthnContext element in the SAML v2.0 assertion. This property is optional: use a custom class when the AuthnContext element created by the default provider does not meet your needs. The class must implement the org.forgerock.openam.sts.tokengeneration.saml2.statements.AuthnContextMapper interface and must be bundled in the AM .war file. Configures mappings between SAML v2.0 attribute names—map keys—and AM user profile attributes or session properties in order to generate Attribute elements in the SAML v2.0 assertion. The map key populates the Attribute element's Name property. The user profile or session property value populates the Attribute element's AttributeValue property. When specifying map keys in the Attribute Mappings property, use the following format: [NameFormatURI]|SAML_ATTRIBUTE_NAME. Map values enclosed in quotes are included in the attribute without mapping. Specify ';binary' at the end of a map value for attributes that have binary values. Specifies whether or not to sign the SAML v2.0 assertion. When enabling assertion signing, you must also specify the KeystorePath, Keystore Password, Signature Key Alias, and Signature Key Password properties. You must also specify the KeystorePath, Keystore Password, and Encryption Key Alias properties. You must not specify the Encrypt Attributes or Encrypt NameID options. AM generates a symmetric key. AM encrypts the symmetric key with the recipient's public key. AM includes the encrypted key in the part of the assertion that is not symmetric key-encrypted. The service provider—owner of the corresponding private key—uses the private key to decrypt the symmetric key included in the assertion. The service provider can then use the decrypted symmetric key to decrypt the assertion. Specifies whether to encrypt the assertion's attributes only. When specifying this option, do not specify the Encrypt Assertion option. When encrypting attributes, you must also specify the KeystorePath, Keystore Password, and Encryption Key Alias properties. Specifies whether to encrypt the assertion's NameID only. When specifying this option, do not specify the Encrypt Assertion option. When encrypting the NameID, you must also specify the KeystorePath, Keystore Password, and Encryption Key Alias properties. Specifies the encryption algorithm to use when encrypting the entire assertion, the assertion's attributes, or the NameID. Specifies the path to the JKS keystore containing the key aliases for encrypting and signing SAML assertions. Specify an absolute path or a location in the AM classpath. AM provides a JKS keystore with demo keys, /path/to/openam/openam/keystore.jks. For more information about AM's keystores, see "Setting Up Keys and Keystores" in the Setup and Maintenance Guide. Specifies the password used to decrypt the keystore. Specifies the key alias in the keystore that holds the service provider's X.509 certificate for this STS instance. This key alias is used to encrypt assertions. Specifies the private key alias in the keystore used to sign assertions. Specifies the password of the private key used to sign the assertion. Properties that determine content in the issued OpenID Connect ID token. For information about OpenID Connect ID tokens, see the OpenID Connect Core 1.0 specification. Properties that determine how the issued token is signed. An STS instance configured to issue OpenID Connect tokens models the relationship between an OpenID Connect token provider and relying party. In other words, an STS instance issues tokens for a particular OAuth 2.0 client. The tokens contain aud and azp claims for the OAuth 2.0 client, and signing key state corresponding to a token provider. Implicit in this model is the notion that an OpenID Connect ID token has value outside of an OAuth 2.0 flow, and that an OAuth 2.0 client, as a relying party, could be generalized as a SAML v2.0 service provider. The ID token is not simply an an entity-provided verifiable authorized access to a specific resource set, but rather a generic service provider that consumes an OpenID Connect ID token to authenticate and authorize the subject asserted by the token. Therefore, the configuration of an STS instance that issues OpenID Connect ID tokens contains information that defines the token provider and relying party. Note that the nonce claim in the ID token is not a configuration property of an STS instance. STS consumers requesting an output OpenID Connect token provide a nonce value when making token transformation requests. Specifies the OpenID Connect token provider issuer ID. Populates the iss claim of the ID token. Specifies, in seconds, the ID token's expiration. Populates the exp claim of the ID token. Specifies an HMAC or RSA algorithm used to sign ID tokens. Specifies how public keys should be referenced in issued ID tokens signed with RSA. OpenID Connect ID tokens are issued as JSON web tokens (JWTs). Tokens can reference RSA public keys as JSON web keys (JWKs), or not at all. Specifies the path to the JKS keystore containing the key alias for signing the ID token. Specify an absolute path or a location in the AM classpath. Specifies the private key alias in the keystore used to sign the ID token. Specifies the password of the private key alias used to sign the ID token. Specifies the secret shared between the client and the ID token generator used to sign the ID token. Specifies the intended audience for the ID token. Populates the aud claim of the ID token. Specifies the party to which the ID token is being issued. Populates the azp claim of the ID token. Specifies additional claim entries to be inserted into the ID token. Specifies entries using the format claim_name=user_profile_attribute. When issuing the ID token, AM populates the claim value with the value of the attribute in the authenticated user's profile. For example, suppose the Claim map property had an entry with the value email=mail. A generated OpenID Connect ID token for user Sam Carter would contain the claim "email":"scarter@example.com" if the mail attribute in Sam Carter's user profile had the value scarter@example.com. Specifies the name of a custom claim mapper class. A claim mapper generates additional claims to be included in the OpenID Connect ID token. The class must implement the org.forgerock.openam.sts.tokengeneration.oidc.OpenIdConntectTokenClaimMapper interface and must be bundled in the AM .war file. Specifies the name of a custom class that generates an acr claim in the OpenID Connect ID token. An acr claim indicates which authentication context class was satisfied by the authentication of the principal asserted in the OpenID Connect ID token. The acr claim is optional and is not included in the generated ID token by default. For REST STS instances, the class must implement the org.forgerock.openam.sts.rest.token.provider.oidc.OpenIdConnectTokenAuthnContextMapper interface and must be bundled in the AM .war file. For SOAP STS instances, the class must implement the org.forgerock.openam.sts.soap.token.provider.oidc.SoapOpenIdConnectTokenAuthnContextMapper interface and must be bundled into the SOAP STS deployment .war file. Specifies the name of a custom class that generates an amr claim in the OpenID Connect ID token. An amr claim indicates which authentication methods were used to authenticate the principal asserted in the OpenID Connect ID token. The amr claim is optional and is not included in the generated ID token by default. For REST STS instances, the class must implement the org.forgerock.openam.sts.rest.token.provider.oidc.OpenIdConnectTokenAuthMethodReferencesMapper interface and must be bundled in the AM .war file. For SOAP STS instances, the class must implement the org.forgerock.openam.sts.soap.token.provider.oidc.SoapOpenIdConnectTokenAuthnMethodReferencesMapper interface and must be bundled into the SOAP STS deployment .war file. Specifies the types of tokens that this SOAP STS instance issues as output tokens for token transformations. Specifies the SupportingToken type in the WS-SecurityPolicy bindings in the SOAP STS deployment's WSDL, and whether the AM session created during token transformation should be invalidated after the token is issued. Specifies a string that identifies this SOAP STS instance. The Deployment Url Element is a component of the SOAP STS instance's endpoint. For example, if you specified mySOAPSTSInstance as the Deployment Url Element, the SOAP STS endpoint would be SOAP STS .war File Name/myRealm/mySOAPSTSInstance. Specifies one or more mappings that define how the SOAP STS instance should authenticate input tokens. (Required) The input token type: USERNAME, OPENAM, or X509. (Optional) The name of the header in which to place the token when authenticating to AM. For X509 input tokens, the format is x509_token_auth_target_header_key=Header Name. Be sure to specify the header name configured in the Certificate authentication module properties as the Header Name argument. Specifies the AM URL. For example, https://openam.example.com:8443/openam. Specifies a supporting token type and security policy binding to protect the SOAP STS instance. This choice will determine the SecurityPolicy bindings in the wsdl file defining the WS-Trust API. If you select the Custom wsdl file option, you must provide the path to a custom WSDL file in the Custom wsdl File property. Specifies the path to a custom WSDL file that defines the WS-Trust API. Specifies the name attribute of the wsdl:service element. Configure this property when using a custom WSDL file. Specifies the name attribute of the wsdl:port element. Configure this property when using a custom WSDL file. Enable this option if the request security token messages can include wst14:ActAs or wst:OnBehalfOf parameters. Note that you must enable this option if the SOAP STS instance issues SAML v2.0 assertions with SenderVouches subject confirmations. Specifies the types of validation support to enable in the SOAP STS instance for USERNAME and OPENAM tokens in wst14:ActAs or wst:OnBehalfOf parameters specified in request security token messages. If the SOAP STS instance supports delegated relationships, configure either the Delegated Token Types property or the Custom Delegation Handlers property, but not both properties. Specifies custom handlers that implement the org.apache.cxf.sts.token.delegation.TokenDelegationHandler interface. The handlers provide validation support for the tokens in wst14:ActAs or wst:OnBehalfOf parameters specified in request security token messages. Custom delegation handlers are typically used when the tokens are custom tokens. Specifies the path to a JKS keystore containing keys for signing and encryption when using the symmetric and asymmetric bindings with SOAP messaging. Specify an absolute path or a location in the AM classpath. Note that the Wsdl File Referencing Security Policy Binding Selection property determines the binding for a SOAP STS instance. Specifies the key alias in the keystore used to sign messages from this SOAP STS instance. You must configure this property when using asymmetric binding. Specifies the password for the signature key. Specifies the key alias in the keystore used by this SOAP STS instance to decrypt client messages for the asymmetric binding, and to decrypt the client-generated symmetric key for the symmetric binding. Specifies the password for the decryption key. Copyright © 2014-2018 ForgeRock AS.